As the world moves towards a greener future one step many families and businesses are taking is to install a native plant garden. This is not only an environmentally friendly step, but a step that will reward you with financial savings in the long run and a wealth of birds bees and butterflies. Aside from the enormous savings in water bills, after a year when the plants establish themselves they usually require very little in the way of maintenance. When planning a native plant garden it is extremely important to consider the water in the area you are planning to fill. Check where the irrigation is and whether it is acceptable for the kinds of plants you are using. Many native plants do not like drip irrigation and many of them cannot be watered during the warm season, particularly after the second year. Consider whether you can eliminate the need for your irrigation system at all. After the second year many native gardens do not need to be watered regularly. Instead they will benefit from having the dust sprayed off their leaves with a hose once a week which is plenty of water for them. An easy way to do check the drainage in the area you wish to plant is to dig a hole and see how fast the water drains. Begin by making a shovel sized hole at a time when the ground is already dry. Fill it with water and observe. If it takes over a week to dry you will probably need a consultation. Anything 1 to 30 minutes is good drainage. If it takes longer than this you may consider a consultation to see what plants can work in a low drainage area or whether it might be beneficial for you to amend your soil based on your desired outcome. Be sure to do this step in all areas where you plan to plant as you may find surprising variations of drainage in different areas of your yard. Also keep in mind that plants located next to your lawn are going to get much more water. The next thing to consider would be the sun. Do you have sun all day in this area or is there shade? Do you have a time of year where there is constant cloud cover or rain that causes seasonal flooding in one part of your yard? You will need to purchase plants that are naturally happy in that environment. Plants that do not have their preferred growing conditions will be unhealthy and require much more maintenance even if you can make them work. If you have a problem garden, again, please consider getting a consultation. Examples of problem gardens are ones with poor drainage, or soil problems like too much salt. Another example is a garden that already has unhealthy natives species, like manzanitas, which have been suffering lately, or California pepper trees which inhibit the growth of other plants underneath them. Problem pests can create a problem garden so consider whether your area is prone to gophers or dear. 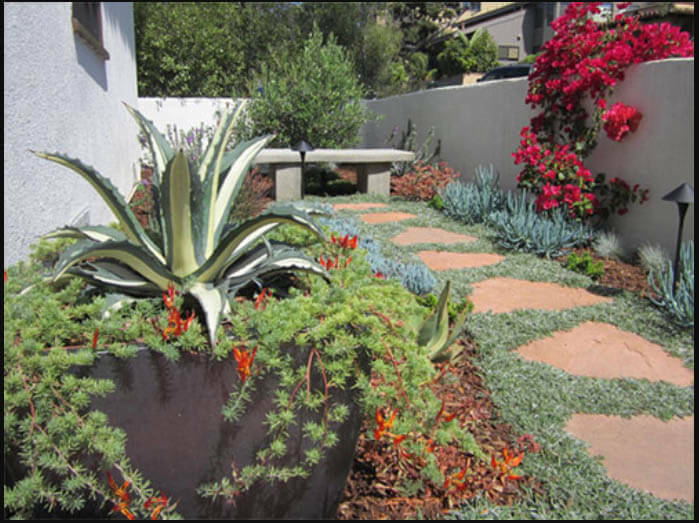 In California it is often important to consider whether you want your plants to be fire resistant. Once you have these factors in mind you should begin to plan the community of plants that you would like to put in that area. By plant communities we mean groups of plant species that exist together naturally in a growing region such as coastal sage scrub, yellow pine forest, or chaparral. Consider the final size of the plants you are putting in carefully. You do not want to plant trees next to your house as their roots can disturb the foundation. You also do not want a lot of watering happening near your house. Only plant annuals in areas where they can be mowed down and consider them as filler only where you can easily pull them when the die off. Make sure you respect the spacing needs of your main plants. There are many plants you can use as filler that will die off naturally as the main plants grow. California poppies are an excellent example. Although this may seem like a big project a little bit of research will save you many headaches in the future. You will save money, help the environment, and after the initial year you will have much less actual maintenance needs as your garden will grows naturally and happily.